This entry was posted in "The Love Song of J. Alfred Prufrock" by T.S. Eliot, comics, illustration, Poetry, Poetry Comics and tagged chambers of the sea, door knocker, mermaids, seamaids wreathed with seaweed, T. S. Eliot, the love song of j. alfred prufrock, till human voices wake us and we drown. Bookmark the permalink. This so rocks! I would not have thought it possible to illustrate this one, but IMHO, you nail it! . . . . I’d love to see a version of “The Sundays of Satin-Legs Smith,” which seems to be Gwendolyn Brooks’ response to this poem. First, I love your comics, especially these on Prufrock. I’m teaching the poem in both my composition and literature courses, and the comics are a great resource for students who claim the poem is “too hard.” I was working on a video to give my students some insight to the poem when I discovered your work last week. I would love to include your pages with the audio of Eliot reading the poem. I think the two together would be the perfect Eliot resource! 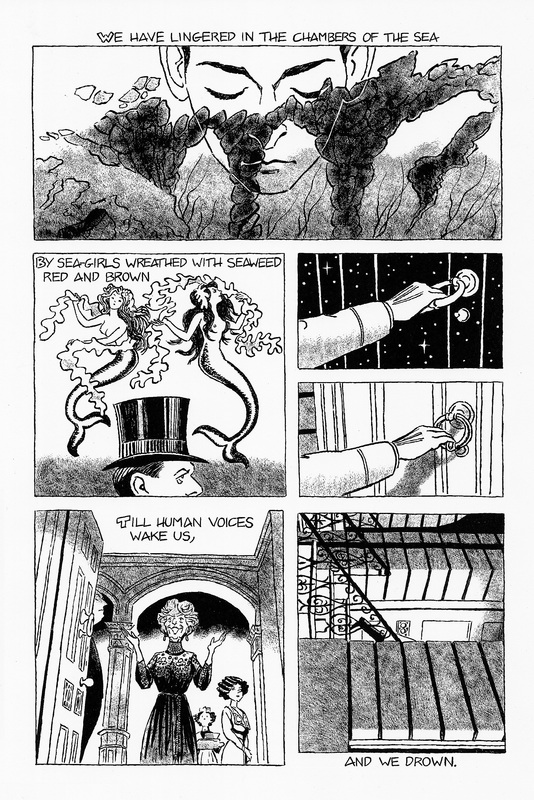 You do such a wonderful job of illustrating Prufrock’s emotions and his view of how people see him. My students never quite understand the part about how he feels “formulated, wriggling on a pin” around the women at the party. I guess they have no point of reference for pin boards! Please let me know your thoughts on the video. One more thing, can I just send you my syllabus in case you need inspiration for future literary comics? Ha! Thanks! A superb piece of work – bravo Julian! You have inspired me to have a go at a cartoon version of Madame George by Van Morrison. I was a student in Belfast 1969 – 1974 (kaboom!!) and walked those Fitzroy Avenue and Sandy Row memory lanes for the first time in 40 years just a couple of weeks ago. That sounds like it would be awesome -you should really do it! I look forward to seeing it! yay it’s finished!!! this is amazing. thank you for doing justice to a fantastic poem. i will buy this as soon as it’s available in print. please let us know when we can! thank you!! Wonderful, wonderful, wonderful: when will they be available for ordering/purchasing? I am way more than eager to get my hands on a handful of copies! C.
Thanks Claire! I’ll put together a zine version soon, but ideally I’d like to find a publisher and have it printed up on quality paper. This is a wonderful project – congratulations on completing it! Do you have plans to publish? I’d like to buy a copy. Thanks! Yes, the next step is to find a publisher.